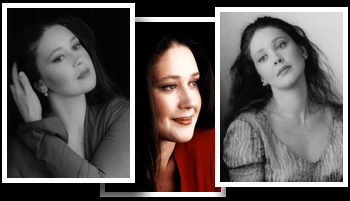 Ether Gvazava (March 14, 1970) - great opera singer who gained world fame by singing in film productions of famous operas. She worked with Giorgia Strehler and sang a leading part in Andrea Andermanns film version of the Traviata a Paris. The tall, slender figure. The sweet smile. The long black hair incorporates the oval face, not typical Russian. "I resemble my father who is a native of Georgia" she says "there, the people are more warm, more passional, a little like you Italians". She is sunshine, disarmed in her spontaneity, with an innocence wich stimulates immediate tenderness and liking. Eteri, in 1995, decides to leave Siberia to accomplish her studies in Germany. Until that moment she studied at the Conservatory of Novosibirsk, "only one night by train from Omsk, where I lived". Her singing-Master was Nina Lubyanovskaya: " the one who I consider is my real Master. She was like a mother for us singers, available at any hour". She settles in Karlsruhe where she attends the Musikhochschule, sustained and assisted by her new Master, Maria Venuti, learns the German language and begins to make a circle of friends, through which, the pianist Peter Nelson, trustworthy and a source of precious advice. On his suggestion, she partecipates in the song Competition "Neue Stimmen", supported by the multinational Bertelsmann, and won the first prize with the aria from Bohйme "Si, mi chiamano Mimi". It is in August 1997 when Eteri receives a telephone call in Karslruhe from an Italian agent "who would later have become my Manager. I came to know successively that my name had been marked out by an unknown person, Charles Spencer, pianist of big Lied-singers like Christa Ludwig and Gundula Janowitz": Giorgio Strehler was looking for young singers, with well defined beauty characteristics, available four months starting from December of the same year, to realize what was for all, crazy, considering the very short time, but for him a dream, at last: to arrange at his Piccolo Teatro (after "Nozze di Figaro" and "Don Giovanni" at la Scala) "Cosм fan tutte" with unknown singers, out of the circle of grand stars and who would be in possession of, above their freshness, the vocal and expressive maturity which Mozart demanded. "At that time I did not know who was Giorio Strehler. An audition was scheduled in Berlin where I went but I did not sing well". It is Carlo de Incontrera, musician, musicologist, composer, from Triest like Strehler and his great friend, who takes care of the auditions in Vienna, Berlin, London, Madrid, New York. It is Carlo de Incontrera who understands, in a flash, the talents of Eteri. "She has a wonderful voice, of an incredible, expressive intensity. It is the most exciting voice that I have heard in these last years. She sung Puccini.... a dream. Surely, Mozart is another thing, phrasing, technic.... But with a voice like this and with that musicality one can do everything. And moreover, she is very beautiful. A perfect Fiordiligi: a snow white flower on a long stem. It is exactly the Fiordiligi that Strehler wants." "My manager often says smilingly that In the beginning there was.... Carlo de Incontrera. If on that day he had not been there to hear me and absolutely did not consider important my indisposition but apprehended the essence of the voice, my road would have been different. Not every-one has the instruments and the autonomy to understand ahead what appears on the other side. I think it was a chance or destiny to interweave my life with a series of persons who changed it". In the period which elapses between "Cosi fan tutte" of Milan and the television production "Traviata a Paris", Eteri has the possibility of creating an operistic repertory in a theatre in the North of Germany, Bielefeld, small but rich in traditions. There, she is far from world-liness and from frenzied rythms of more big theatres; in a pleasant and family environment finds a particular support in the person of Regula Gerber and August Haltmayer, the Intendent and Musical Consultant respectively. The season is programmed on operas to her congenial. She acquires security and boldness. 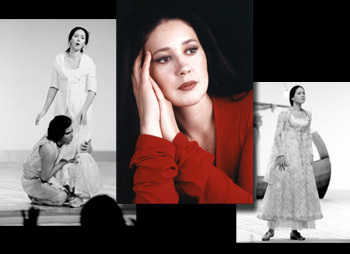 Debuts Tatjana, Liщ, Micalela, Gretel, Donna Elvira, and in October/November 2000, Rusalka.